Take this to heart and if you can, take a break from your study routine and nap between learning sessions. According to a 2009 Northwestern University study published in the journal SCIENCE, listening to audio can deepen and strengthen memory and learning – even when one is sleeping. 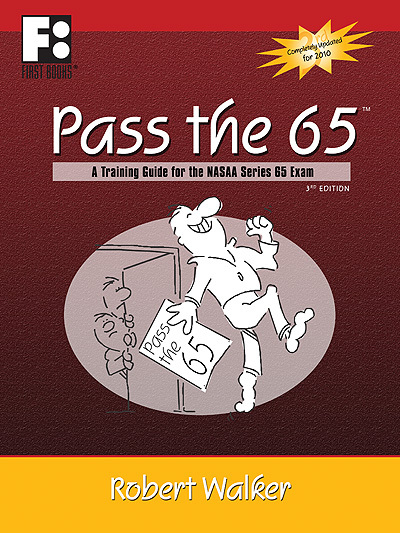 Solomon Exam Prep is excited to announce publication of new and fully updated 2010 editions of our bestselling PASS THE 6, PASS THE 63 and PASS THE 65 audio training guides for the FINRA Series 6 exam and the NASAA Series 63 and 65 exams. Does her voice sound familiar to you? If you’ve ever called our office, you’ve probably spoken with Linda since she also answers the phone around here! What is a passing score for the FINRA Series 79 exam? This month, we’ve talked with several individuals who have taken the Series 79 Limited Representative Invesment Banking exam. They reported that a passing score was either a 72 or a 73. FINRA is grading the exam on a “floating curve.” These individuals, experienced investment bankers and M&A professionals, also reported that the exam was challenging, detailed and surprisingly mathematical. Author JSolomonPosted on January 14, 2010 September 23, 2011 Categories FINRA, Series 79Tags FINRA, Series 79Leave a comment on What is a passing score for the FINRA Series 79 exam? First complete Series 79 practice exam available now! Solomon Exam Prep has published the first complete 175 question practice exam for the FINRA Series 79 Limited Investment Banking Representative Exam. Questions follow the format, proportion and four major content areas of the actual exam and were written by an experienced investment banker, practicing attorney and former hedge fund compliance director. Author JSolomonPosted on January 9, 2010 September 23, 2011 Categories Series 79Tags FINRA, hedge fund, Investment Banking, investment banking representative, Series 79Leave a comment on First complete Series 79 practice exam available now! If your firm has not created a Series 79 training program, contact Solomon Exam Prep to sign up for our exclusive Series 79 Investment Banking Representative licensing exam program offering live/interactive online classes, a Series 79 training book and a state-of-the-art practice question Series 79 exam simulator. With decades of teaching experience and thousands of happy customers, our Wharton, University of Chicago, Yale and Harvard-educated staff will help your firm get Series 79 candidates licensed and on their way to making your firm money! Contact Sara DeFilippi at 503-968-6777 for more information. Effective January 1, 2010, NASAA and FINRA will raise the passing grade for the Series 63, Uniform Securities Agent State Law Examination, from 70% to 72%. The new raw passing score will be 43 out of 60. Can listening to audio books during sleep improve exam scores? Research at Northwestern University, published in the journal Science, suggests that playing a reinforcing audio while sleeping might improve retention of information already learned. Author ProfessorPosted on November 27, 2009 September 23, 2011 Categories Study TipsLeave a comment on Can listening to audio books during sleep improve exam scores? Effective January 1, 2010, the NASAA and FINRA will raise the passing grade for the Series 65, Uniform Investment Adviser Law Examination, from 68.5% to 72% and for the Series 66, Uniform Combined State Law Examination, from 71% to 75%. Research shows that time spent studying is a very important factor in how much you learn. For example, it has been shown that simply reading material twice, rather than once, greatly improves memory retention. However, time is not the only factor in learning and in preparing for an exam. The quality of time spent studying is also critically important. For example, rather than trying to learn something all at once, try to pace your learning over a longer period of time and take breaks. So called “spaced” or “distributed” learning is much more effective than “cramming” at the last minute. Testing yourself has also been shown to substantially increase long-term recall which means that the more quizzes and practice questions you do, the better prepared you will be for your exam. Finally, studies show that mnemonics help, especially those that create a mental image. One last word of wisdom: avoid overconfidence at all costs! Studies show it is among the top reasons people do poorly on exams.